CCTV Cameras Catch an Indian Biker stab a woman 24x, until she died. New Delhi : On a road in Delhi this morning, a man stopped his bike, attacked a young woman and kept stabbing her till she stopped moving. The indifference that has shamed Delhi several times is on display in CCTV footage, which reveals that at least a dozen people did nothing to help 21-year-old Karuna. The alleged killer, Surender Singh, has been arrested. Karuna, a teacher, was stabbed some 30 times on a busy road in Burari in north Delhi. Her family had complained to the police about five months ago that she was being harassed and stalked by Singh, a 34-year-old neighbor in the middle of a divorce. It is not clear why no action was taken. The police claim the two families had “reached a compromise”. 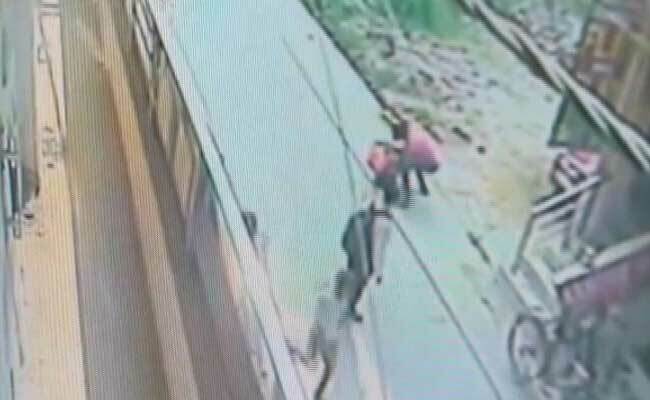 CCTV visuals show the attacker stabbing the woman repeatedly as she thrashed about helplessly. Some glanced and kept walking, others watched in horror but failed to react. Two persons were seen moving towards the woman but backing off. The woman soon stopped moving but the attacker didn’t. He went at the prone body a few more times with his knife. Then he was seen picking up a stone and bashing it against her head. He finally gave the body a hard kick before walking to his bike, unchallenged and apparently unconcerned about being caught. A witness, Manish Kumar, took Karuna to hospital in an auto-rickshaw. “I ran and went to help the girl. I called on 100 twice, the police did not come, then I called the ambulance, no one came,” he added. Karuna’s family protested outside the hospital. “The man had been harassing my sister for a long time. He stays in Rohini. We had filed a complaint, after which he had calmed down…until now,” said her brother.